Our managers for 2019 are Shelagh and Colin O'Brien. They can be contacted during winter on the lodge phone 03 5759 3593. Please only contact them directly if you have last minute problems or if you have issues on the mountain. If you have booking enquiries, more detail can be found on the bookings page. Mount Hotham is Victoria’s highest permanent alpine village. 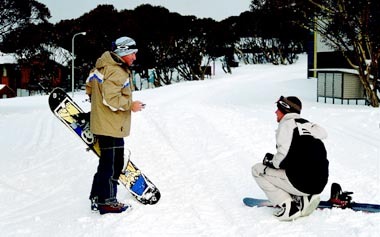 It is also widely regarded by skiers as “the skiers mountain”, a destination nestled high in the Great Dividing Range that offers a broad variety of ski runs from beginners, right through to the most challenging of black runs. If you appreciate this delicate Australian alpine environment, value the ambience of an architecturally appealing property and wish to spend your leisure time amongst like-minded families and guests… then Peninsula Ski Lodge delivers this and much more. The lodge's rustic exterior gives way to high vaulted ceilings which maintain rustic charm through the extensive use of warm timber tonings. The fireplace is huge and is complemented with comfortable couches. Throughout the lodge there are plenty of quiet corners to enjoy private moments. Peninsula Ski Lodge has eight bedrooms, each with its own private en-suite bathroom, central heating and storage facilities. Spread over two levels the bedrooms range in size from three-bed rooms through to a six-bed bunk room. Each bedroom has comfortable beds, all fitted with doonas, pillows and blankets. 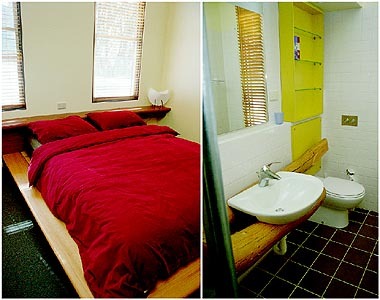 All you need to bring is sheets, pillowcases, doona covers and towels. Total sleeping capacity of Peninsula Ski Lodge is 33 beds. When you come in from a day on the snow, the welcoming large entrance foyer is just the place to sit down and remove your snow gear. 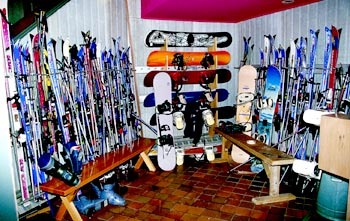 Skis, stocks and boards can all be racked in the foyer, while the adjacent drying room provides a cavernous facility to hang wet gear and dry out boots. Why not move through and relax in the fabulous glass walled spa. This has to be the most appealing of spas with full height glass walls overlooking the valley and snow covered mountain ranges beyond. Winter or summer, the alpine resort at Mount Hotham holds a powerful appeal for many visitors. Regarded as the premium snowfields in Victoria, Mount Hotham is continually being up-graded with new ski lifts and facilities to ensure that this destination delivers exceptional skiing facilities and easy winter access. Through summer, the Australian Alps offer a wonderful range of activities which include bush walking, horse riding, photography, trout fishing, nature trails and much more. By using Mount Hotham as your summer holiday base, you can experience all the variety of central Victoria right through to Gippsland and beyond.